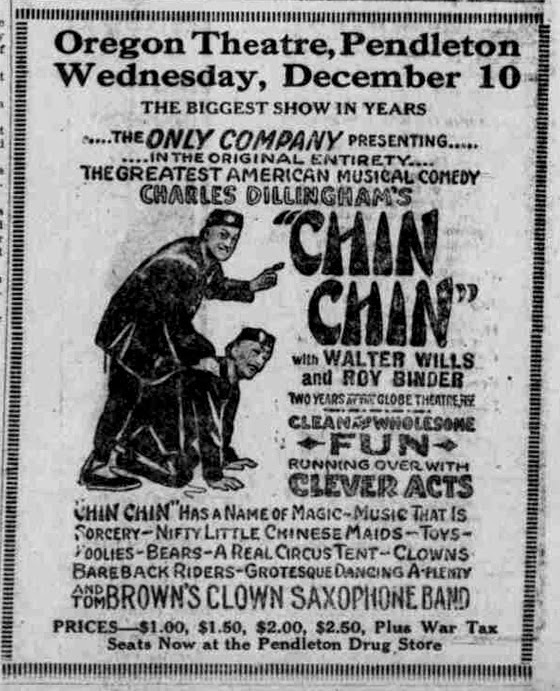 I’m not sure yet where the Chin Chin group was on December 8th and 9th, but the on December 10th the company played a one night show at the Oregon Theater in Pendleton, Oregon. This is very odd and, so far, the only reference to her with the name “Mina.” We don’t know yet if it was just a typographic error in the paper or if she was trying on a new stage name. Further research will tell. We know that Donna had the part of the Goddess of the Lamp so this name difference was odd. Two solos, “Violets” and “The Gray Dove,” were sung by Mina Montran, who as the leading singer, had the part of the Goddess of the Lamp. This second use of “Mina” indicates to me that it wasn’t a typesetting error. We’ll see if we can find Donna and the “Chin Chin” company at another venue in the days preceding or following this venue. The 1913-14 Julius Cahn Gus Hill Theatrical Guide reports Pendleton having a population of 5,500 people. The Oregon Theatre was on the second floor and could hold an audience of 684 people, 324 on the main floor with 160 in the balcony and another 200 in the gallery. The stage was a small 25 x 18 feet with a backstage width of 49 feet. With only a one-night show it is unlikely that the cast stayed in any of the four recommended hotels, Pendleton (the nicest at $2.00/night), St. George, Bowman, or Golden Rule. They would have arrived, set up, did the shoe, packed up, and headed for the next town all in the same day. I have been unable to find out much information regarding the Oregon Theater in Pendleton. I have contacted the Umatilla County Historical Society to see if they can direct me to history regarding the theater.